Smart. Modern. Organized. That’s the idea behind Three by Three, a Seattle-based company that makes daily planners designed to keep your life in order and your home décor in style. A sleek, clean alternative to traditional whiteboards, the magnetic glass dry erase weekly planner features a silkscreened section for every day of the week with ample room to write your to-dos and daily reminders. Behind the sophisticated beveled edges of the shatterproof glass surface hides a metal backing enabling magnets to work their magic on glass. 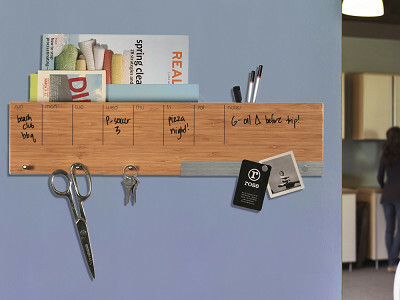 Includes a dry erase pen, stainless pen shelf, mounting hardware, and two magnets. The stick-it! silicone dry-erase weekly and monthly planners adhere to any non-porous surface including glass, refrigerators, walls, and desks. Removable, reusable, and non-scratching, these planners make great homework helpers for dorm rooms and bedrooms. They also come in handy for younger kids learning to keep track of the days of the week, their activities, even their daily chores. The sort it out! 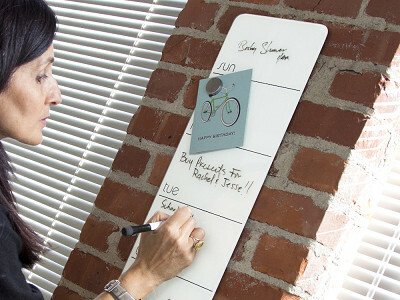 dry-erase wall caddy is the keeper of all keepers, perfect for keys, cell phones, mail, and more. 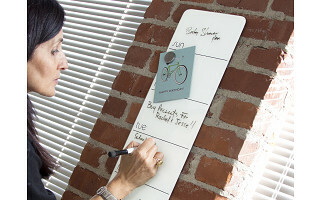 Its dry erase surface is just the thing for jotting down notes on your way in and out the door. A helpful addition to any entryway, kitchen, or office. Getting organized is a beautiful thing—especially with visually appealing solutions from Three by Three. An efficient and functional wall solution for entries, kitchens, and offices. The dry·erase weekly and monthly planner are a great option for home, school, or office organization. Hello! 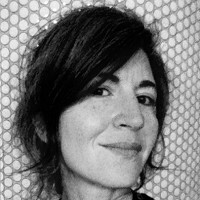 I'm Gwen Weinberg, co-founder and designer at Three by Three Seattle. We are always thinking about new products for our line. What organizational issues in your home office or kitchen office do you encounter that you would like to see solved? I love this idea! I ordered the silicone monthly dry erase planner but think I want the weekly as well. Is there a way I can add that to my order and pay one shipping? Thanks! Can't wait to get them! Hi Rachel, Glad you like the Three by Three Silicone Planners. Most of our office is using them. and we love them! Please contact our Customer Support Team at 1-877-862-0222 and they will be happy to help you . Can the silicone dry erase planner be flipped over and used on the back if I just want to use it for lists? We wouldn't recommend this. The back is the sticky side that you need to use to adhere it to a surface. Plus, writing on the sticky surface would be more difficult.